Taiko is too much fun! Come join our Beginners Class and experience Japanese Taiko drumming first hand. 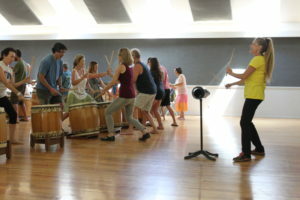 Our Beginners Class is a great way to experience Taiko for the first time. You’ll jump right onto a drum and begin to learn the basic rhythms and fundamentals of movement from Sensei Mitzi Garnett. Taiko Beginners Class is offered every week on Thursday evenings. All ages are welcome to join! For more information contact us, info@grassvalleytaiko.com, or just come by the dojo on a Thursday night between 5:30 and 7 PM to see for yourself! verb; a physical art form that originated in China and was transported to Japan centuries ago. Almost considered a festival relic of Japan, which has since been reshaped over the past four decades and has re-emerged as an art form of its own. noun; the primary drum used in the modern ensemble groups that play Japanese style drumming. Taiko, a Japanese style of drumming, has a long and rich history. Originating in China, it traveled through many countries and took on various forms, finally settling profoundly in Japan. Here, it was used to call the Gods to alter existing conditions such as warding off pestilence, bringing rain, blessing a harvest or inviting the ancestors to join in celebration of the family. Villages used the drums to communicate, soldiers were sent to war and fishermen called in from the sea. Taiko was once very utilitarian. As Japan became influenced by the West, certain traditions were left to the elders to carry. As many young people struck out for America and all the dreams that it held, these traditions were left behind. For a while. Soon, the beating of the drums was greatly missed as traditional festivals began to surface in America. A few frontiersmen took the lead in bringing Taiko to America. Among them, and one of the most influential, is Grand Master Seiichi Tanaka of San Francisco Taiko Dojo. He is noted for having started or influenced most groups that have since sprung up in North America. Mitzi Garnett, student of Grand Master Tanaka, has carried that torch and formed Grass Valley Taiko. Founded in 2000, the group has taken root and is now actively participating in many community events. Mitzi’s creative interpretations of traditional pieces along with those created by the members of Grass Valley Taiko, presents a variety of styles and rhythms to appease the audience.